Forest City Fashionista: Out, Damn Blues! It was wrapped in tissue from a Butterick dress pattern; creative, and environmentally conscious, Sarah is! Inside - a very cool book about a little rat who lives in a bookstore, and discovers that by eating books, he is able to read. 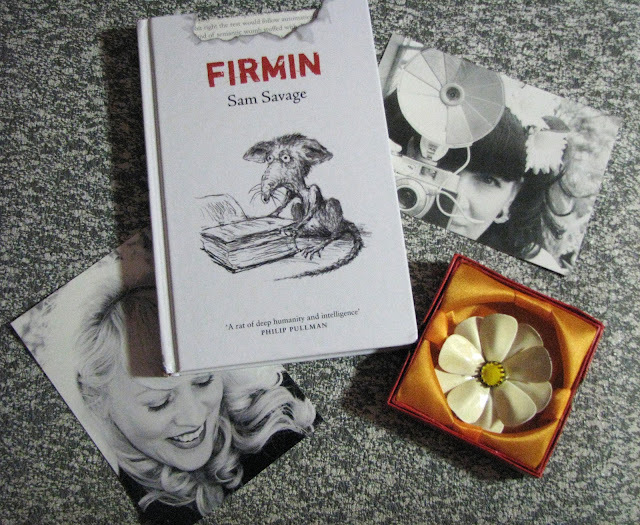 I'm not sure I'm going to start feeding Fred pages of my personal library, but it looks like a delightful read; two photo postcards by Miss Misfit herself, and a lovely flower brooch in a cute little box. Sarah, your timing was perfect, and thank you, for ending my day on a high note. This is what I was wearing that day. The sweater dress was thrifted, and I wear it a lot in the winter as it is warm and layers really well. I accessorized it with red, plaid, and silver, flat hair, and my best attempt at a smile. I am having a girl weekend with a good friend that is hopefully going to include good food, cocktails, shopping, and maybe even some dancing, so those blues can just go **ck themselves! Cast your blues into the wind! They're only a bookmark for better days to come. February is a drag, but you got some great things to cheer you up there. I love cats in that kind of pose!!!! Squee!! 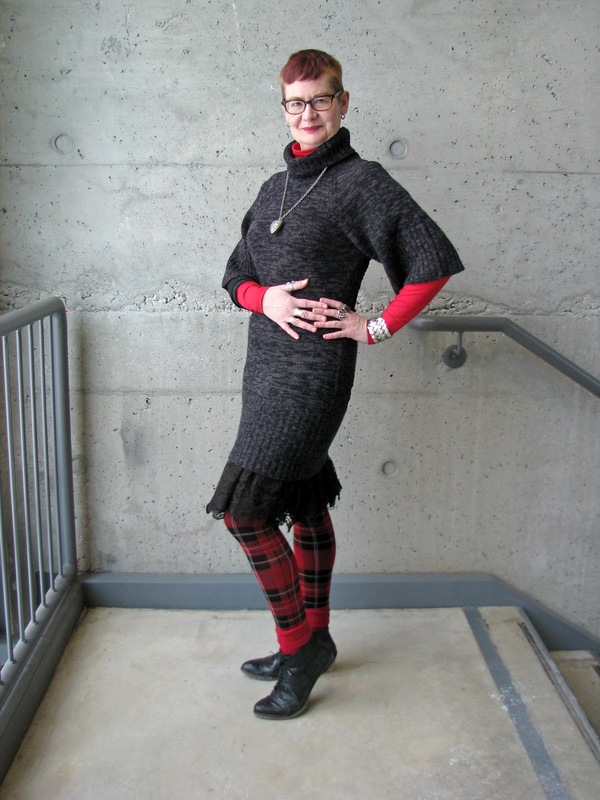 Love your sweater dress - I am still looking for that perfect one! How lovely of Sarah - isn't it nice how our blogfriends chase the blues away? Yes, I know what you mean about the winter blues. Mine come in February. Not every year, but sometimes I think I get a double dose to make up for lost time. The thing is, there is nothing wrong. It's just... well, who knows what it is. One too many winter days? Dunno. But thank goodness it does pass. Clothes always help and finding bargains, and friends, and of course, adorable photos of cats. The winter blues are a real drag, but that outfit portrays a gorgeous woman dressed creatively with a pose that would stop traffic. How lovely that Sarah's thoughtful parcel arrived to brighten your day. Hope that the blues lift soon, Shelly. Sorry to hear you have the blahs, but how nice to receive such thoughtful gifties in the post from far away. And you look great; I love the sweater dress with the slip peeping out. You look warm and cosy yet oh so chic. Have a wonderful time with the gals! Ah Shelley, I'm sorry you have the blues. 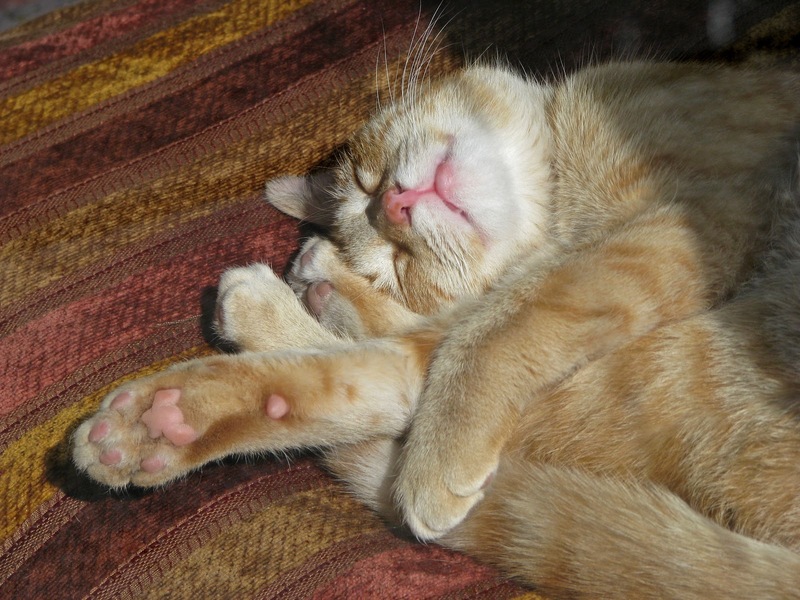 The strategy of looking for something to make your smile is a good one, and no one could resist that gorgeous ginger cat showing his beans! Blog buddies are also a great source of good cheer, and Sarah's lovely gifts were obviously very well timed. What great stuff to get in the mail - that would lift anyone's spirits!! POOS to the BLUES! It's hard not to get a bit down near the end of a long, long Winter. Cats are just the ticket to make a gal smile! I adore toe beans, incidentally, and frequently annoy my cats by playing with theirs. Sarah is a GEM. Fabularse timing! That book looks so sweet! And the brooch! DIVOON! it won't be long before we'll need encouraging words to get US through the Winter, I'm sure!!! nothing better than a parcel of joy to cheer up your day, so lovely Sarah! And I'm loving that plaid leggings and that frilliness poking out your knitted dress, you looks ready to fight any blues!! 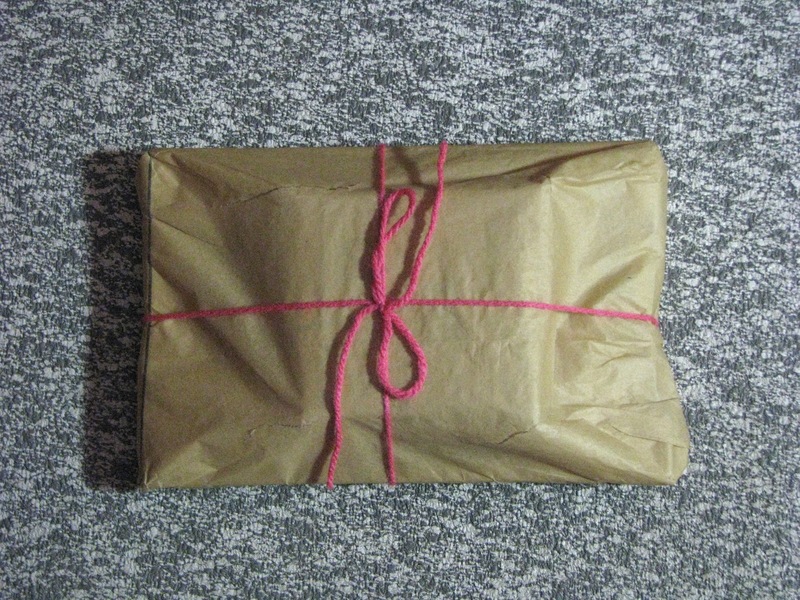 Big BIG hugs lovely Shelley - I'm so glad you liked your parcel. You look absolutely gorgeous in this beautiful cosy outfit (LOVE the red) and I hope the blues disappear STAT! It's hard this time of year! I know ! i have been having for 2 weeks now, congested to the bone i think! Love your outfit, true Shelley! I'm glad Sarah sent you a bit of her sunshine- what a treat! Give your kitten a scratch behind the ears for me. And yourself a big hug. Wonderfully composed outfit but oh my!! I love those tights.